Struggling with the sniffles? If you’re like me, I always manage to catch an annual cold. It usually sneaks up on me when I’m stressed or busy. This was especially the case in university. Whenever I’d get sick (which was a lot – university was stressful), I’d run to my next-door corner store, grab a 2L of orange juice, and browse Google for a “natural immune-boosting tonic”. After enough colds and an OJ overload, I ended up formulating my own immune-boosting tonic recipe: it’s the only thing that really helped! What’s an immune-boosting tonic, you ask? Well, it’s pretty self-explanatory: it’s a concentrated combo of immune boosting foods. Each food has its own healing properties to address specific cold symptoms. 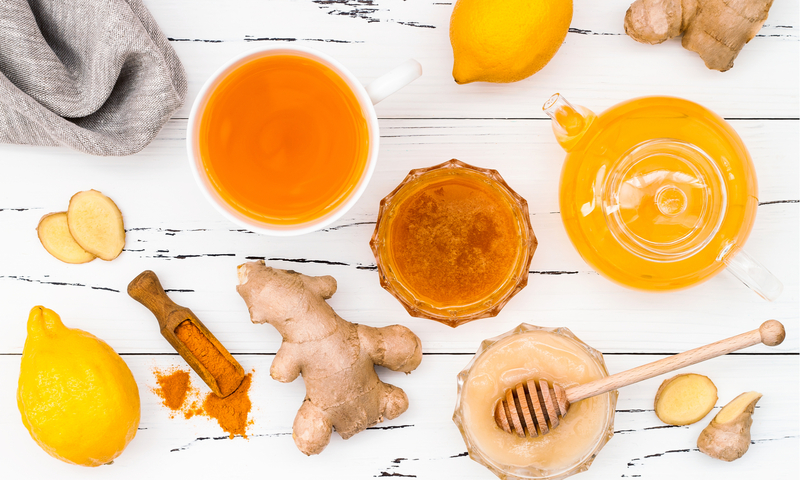 I like ginger, turmeric, apple cider vinegar, cayenne pepper, and honey. Ginger helps with respiratory viruses (like clearing a cough and sniffles), turmeric is a straight-up immunity superhero (but specifically helps with clearing respiratory infections and boosting overall immunity), apple cider vinegar helps thin out mucus and balance your body’s pH levels, cayenne pepper also thins out mucus and brings your body temperature down, and Manuka honey is antiviral, antibacterial and specifically helps with a sore throat. Mix these with hot water and boom. So long, cold. Optional: lemon. Lemon is rich in vitamin C and just tastes great. I’d recommend it! Try adding ½ a lemon. Optional: garlic. One time when I was going hard with the tonics, I tried adding garlic for its antibacterial properties. It didn’t taste great and it wasn’t enjoyable, so I wouldn’t necessarily recommend it. However, if you’re either really sick or feeling bold, go for it. ½ a clove is more than enough. Add the water, turmeric, apple cider vinegar, ginger, lemon or garlic if using, and cayenne pepper to a pot and bring to a boil. Do not add the honey yet! It will kill all of its active ingredients, which is not what you want. Once the mix has boiled, let it simmer for 10-12 minutes. Strain and add the honey. If you’re sniffly, breathe in the concoction at this point! The cayenne will work its magic. Sip away! Bye bye cold. How else do you push through a cold? Other ways for me are light exercise, a neti pot, and loading up on probiotics. Also, if you’re really down in the dumps, take a rest day! If you try and push through without giving your body what it needs – which is likely a break – it will only get worse, and likely infect your coworkers too. Speaking from experience, no one wants that. Just stay home. Outside of her role as a Social Media and Content Coordinator, Carli enjoys exploring the local BC trails, spending time with loved ones, and fawning over any dog she lays eyes on. Skip Takeout – Try Homemade Pizza! Microgreens: Are They Worth The Extra Penny?